SEEING IS BELIEVING! 3D HoloSpex™ glasses with patented holographic lenses bend the light creating a magical pattern from every bright point of light. Amazing patterns, images and logos spring to life creating a visual spectacle and a lasting impression. 3D HoloSpex™ glasses create spectacular holographic illusions on any bright point of light for holidays, grand openings, and corporate event sponsorship. The exclusive patented lenses in 3D HoloSpex™ glasses produce spectacular results on Christmas lights, holiday light displays, fireworks, and city lights. Custom printed with company logos, coupons and advertising on the frames of the glasses, 3D HoloSpex™ glasses are a highly effective and affordable marketing tool for direct mail, product introduction, and in-pack premiums. 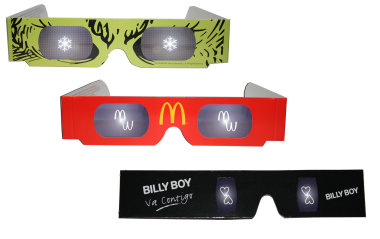 With 3D HoloSpex™ glasses, we can customize a unique lens that shapes each light source into company logos or designs or choose from any of our fabulous current stock lens patterns. Imagine the advertising impact of having your logo or clients message floating magically on every point of light! SEEING IS BELIEVING! 3D HoloSpex™ lenses are protected under US patents 5,546,198 and 6,452,699. Make sure to click on the Holospex™ video below in order to see first hand the magic and excitement that goes along with our unique 3D HoloSpex™ glasses.